© 2017 Yenumula et al. The design of direct embedment pole foundations involves calculating the ultimate moment capacity and deflections/rotations of pole foundations at groundline. 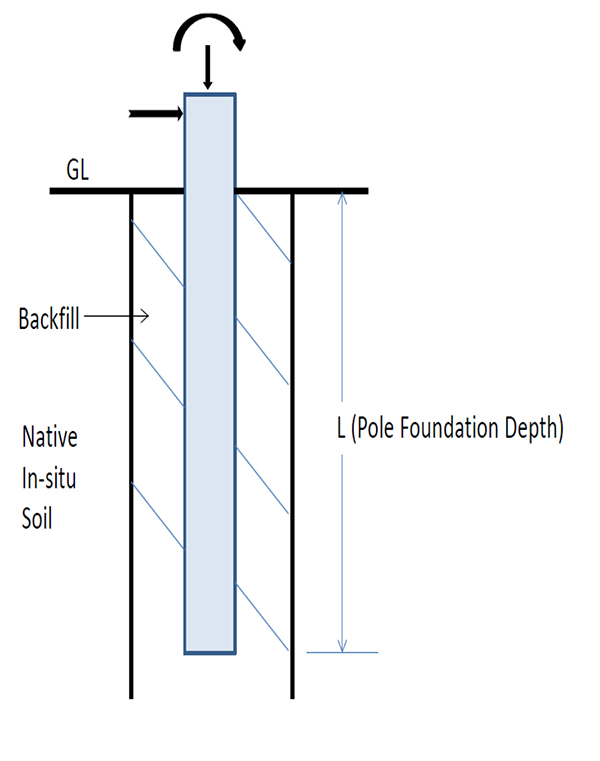 A theoretical model based on rigid piles is used as a basis for developing equations for the ultimate moment capacity of direct embedment pole foundation installed in granular soils. The steps involved in the development are presented in this paper. Prototype test data are used to compare the predictions of the model and to validate the proposed method. Keywords: Direct embedment, Moment capacity, Pole foundations, Granular soils, Rigid piles, Prototype. Direct embedment of a pole implies that the borehole prepared has a diameter larger than the pole and that the annular space between the pole and the borehole is backfilled with excavated native soils or select granular backfill materials. A typical direct embedment pole foundation is shown in Fig. (1). The design of these foundations involves the calculation of ultimate moment capacity and deflections/rotations of the pole foundation at ground line. Fig. (1). Schematic of a direct embedment pole foundation. The pole length is in the units of meters and the typical value of X is 0.61 m (2 ft). However, several utilities use higher adder values based on their internal standards. The obvious shortcoming of this methodology is that the pole embedment depth does not consider any of the factors listed above and thus is not based on sound engineering principles. A semi-empirical theoretical model was developed  for direct embedment foundations and this model is included in the software program called MFAD TM . The MFAD stands for Moment Foundation Analysis and Design and this software is used by several US utilities. In this paper, a theoretical model developed for the design of direct embedment pole foundations under moment loads installed in granular soils is discussed in detail. This method is useful for preliminary design of direct embedment pole foundations using simple long-hand calculations. This theory was originally developed by the authors as a part of the CEA Report . 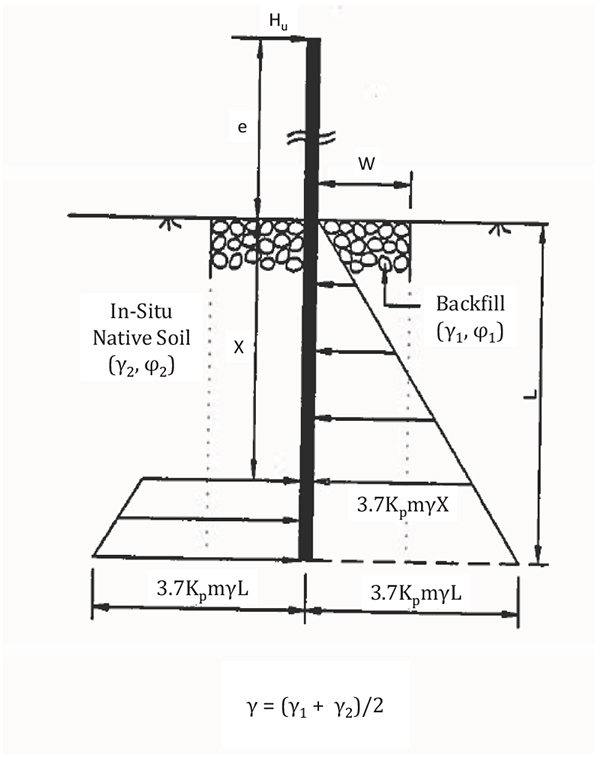 A typical pole foundation subjected to moment loads essentially behaves as a rigid pile under lateral/moment loads (hence in this paper rigid pile and pole foundation used synonymously). However, the interaction between the backfill and native in-situ soil complicates the analysis of these pole foundations. The theory developed to estimate the ultimate lateral/moment resistance of a rigid pile in two different soil media (i.e. backfill and native in-situ soil) is discussed in this section. Most of the theories proposed for the calculation of the lateral capacity of rigid pile are based on the theory of earth pressure on a rigid retaining wall. The ultimate lateral resistance per unit width of a rigid pile is greater than that of a corresponding wall due to the shearing resistance on the vertical sides of the failure wedges in the soil . The last step is basically applicable to direct embedment pole foundations. Fig. (2). Long retaining wall under passive earth pressure conditions. The resultant reaction, R between the wedge and the rest of the soil along the surface BC. As indicated earlier, the ultimate lateral resistance per unit width of a rigid pile is greater than that of a corresponding wall, due to the shearing resistance on the vertical sides of the failure wedges in the soil. Using the same distribution of earth pressure at failure of the pile as was assumed for the wall, the three-dimensional effect for a pile can approximately be taken into account by multiplying the net earth pressure on a wall by shape factor (Sf). 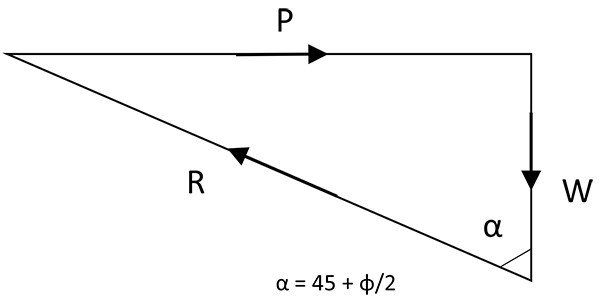 The pressure distribution on a rigid pile at any depth z can be calculated by multiplying Equation 5 with the shape factor. 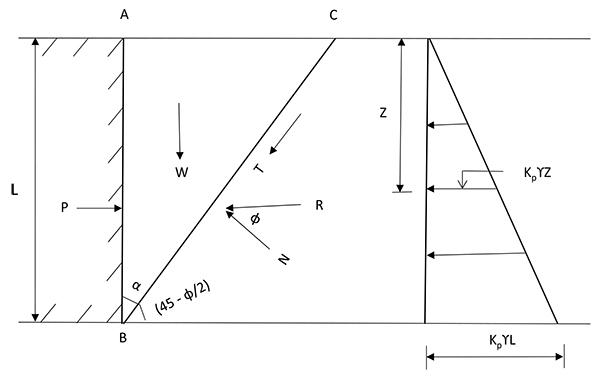 Typical shape factors adopted by a few investigators for a rigid pile, with depth of L and width of B, are summarized in Table 1. Table 1. Typical shape factors. Fig. (4). Long retaining wall under passive earth pressure conditions with backfill and in-situ native soil conditions. In the above equation, γ is assumed to be the average of unit weights of backfill and native in-situ soil. The shape factor is of constant value 3.7 as used by Petrasovits and Award  for rigid piles. The type of distribution assumed was similar to the one presented by Petrasovits and Award  for rigid piles. The active earth pressure effect behind the back of the pile is neglected. Fig. (5). Passive pressure distribution on direct embedment pole foundations. From the horizontal force equilibrium and moment equilibrium of forces shown in Fig. (5), the ultimate lateral resistance Hu and ultimate moment resistance Mu are calculated using the equations shown below. In the calculation of Kpm for pole foundations, ‘n’ is the ratio between the thickness of annular space around the pole and embedment depth of pole. The value R is estimated from the definition of ‘e’ to be 0.707 for pure bending moment and 0.794 for pure horizontal load. Note that pure bending moment corresponds to the case where e = ∞ and pure horizontal load when e = 0. For a given combined moment and horizontal load, R can be calculated using the equation below. e = eccentricity or elevation of Hu above ground level (m). The capacities calculated using the theory proposed in this paper are compared with results from six (6) prototype tests on direct-embedment pole foundations. Test data used refer to investigations by Haldar et al  and by GAI . The comparisons are summarized in Tables 2 and 3. In these prototype tests, the ultimate moment capacity is defined at the moment that corresponds to 2 degrees of pole foundation rotation at ground line. Table 2. Comparison between CEA Prototype Test Results  and Predicted Capacities. Table 3. Comparison between GAI Prototype Test Results  and Predicted Capacities. In general, the predicted results are in reasonable agreement with the prototype test results. The ratio of theoretical predicted capacities to actual test capacities varied from 0.68 to 1.71 with an average value of 1.07. More test results are required to perform thorough statistical analysis to generalize the observations and to establish strength factors for reliability based design approaches. A simple theoretical model developed from fundamental concepts to calculate the ultimate moment capacity of pole foundations is presented in this paper. The model is based on rigid pile theory and extended to direct embedment foundations. A few prototype tests are used to validate the theoretical predictions. The predicted results are in reasonable agreement with test results. This method is useful for the preliminary design of direct embedment pole foundations using simple long-hand calculations. In the future, the theory can be extended to uniform cohesive soils and multi-layered soil conditions. The authors would like to acknowledge the help of Alex Mogilevsky and Aleksandra Modelewska of CEATI International for granting us permission to use our theory in this paper which was originally published as a part of the CEA report 384 T 971 (1997). Bragg RA, DiGioia AM Jr, Longo VJ. 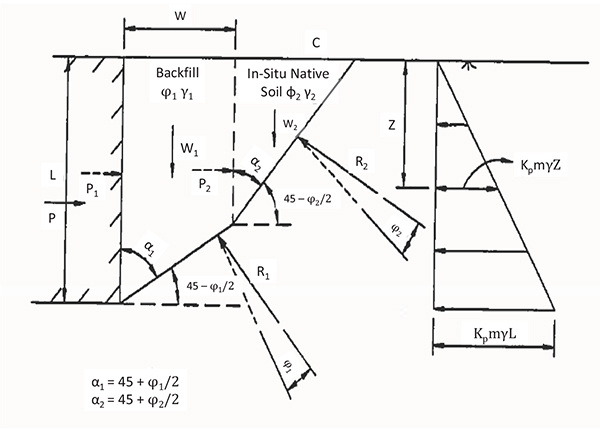 Foundation Design for Directly Embedded Single Poles Presented at the American Society of Civil Engineers Convention, Atlantic City, New Jersey, Geotechnical Special Publication, 1987, pp. 160-174. MFADTM. Moment Foundation Analysis and Design Version 51. Electric Power Research Institute (EPRI), Palo Alto, CA, USA 2014. Haldar A, Chari TR, Prasad Y. “Experimental and Analytical Investigations of Directly Embedded Steel Pole foundations,” Can. Electric. Assoc. (CEA), Ottawa, CAN, Report 384 T 971, 1997. Terzaghi K. Theoretical Soil Mechanics. New York: John Wiley & Sons, Inc 1943. Coulomb CA. Essai Sur Une Application Des Regles De maximis Et Minimis A Quelques Problems De Statique Relatifs A L’ Archtecture, Mem. Roy. Des Sciences, Paris Vol. 3, pp.38, 1776. Broms BB. Lateral Resistance of Piles in Cohesionless Soils ASCE Journal of the Soil Mechanics and Foundations division, vol. 90, pp.123-156, 1964. G. Petrasovits, G. and A. Award, “Ultimate Lateral Resistance of a Rigid pile in Cohesionless Soil”, in 5th European Conference of Soil Mechanics and Foundation Engineering, vol.1, pp. 407-412, 1972. Meyerhof GG, Mathur SK, Valsangkar AJ. Lateral Resistance and Deflection of Rigid Wall and Piles in Layered Soils Canadian Geotechnical Journal, vol.18, pp. 159-170, 1981. Bragg RA, DiGioia AM, Rojas Gonzalez LF. Direct Embedment Foundation Research Empire State Electric. Energy Res. Co., and Electric Power Res. Inst., Palo Alto, CA, Report EL-6309, July 1989.